Sometimes, you just want to know what kind of object is passing through your star trails or star stack. Why? Could be for any reason, but the most obvious is that in post-production you might prefer eliminating one type of streak in the sky while not eliminating another. Or, you might just be curious. Fear not, astral observer and recordist! I will guide you in how to identify and classify plane trails, satellites and meteors. They are almost always solid lines with hashed or dotted lines on either side. They travel at a predictable rate, often spanning many frames in an exposure stack. Usually, they travel in a predictable path. But, they are not always straight! You may see course changes that curve away from the initial heading. Nikon D750 with a Zeiss 15mm Distagon f/2.8 lens. Six exposures at 30 seconds, f/5.6, ISO 6400. Satellites are very thin and often dim paths with no other markings alongside. In my experience, they move slower than planes, and so they also can span more than one frame in a star stack. The trails from satellites are solid lines that are the same brightness from one end point to the other. They do not taper in and out like a meteor (keep on reading for details). Nikon D750 with a Zeiss 15mm Distagon f/2.8 lens. Ten exposures at 30 seconds, f/5.6, ISO 6400. If you want to know with certainty (or get notifications) when a satellite or the International Space Station is passing overhead, there are a ton of apps for that. See this article from Space.com for a couple of suggestions. Lance uses Sky Guide (iOS only) with great success. Meteors taper in from nothing or a very thin path at the start point and taper out again at the end of the path. They move faster than planes and satellites, and thus often appear in only one frame, possibly two (depending on your exposure length). They can be many different colors, depending on if they flare up during entry. They almost always appear in only one frame, because they move fast and burn out quick! Bonus! There’s something else those night streaks might be. Iridium flares. Iridi-what, you might ask? Yeah, I kinda asked the same thing when Gabe and Lance mentioned them to me while looking at the photos I pulled for this post. Iridium flares are the reflections from a certain set of communication satellites with highly reflective antennae. When they line up properly with sunlight streaming past Earth, they glow while traveling through the night sky for up to 20 seconds. Nikon D750 with a Zeiss 15mm Distagon f/2.8 lens. Two exposures at 30 seconds, f/5.6, ISO 6400. Alas, as cool as these can be to shoot, they won’t be shooting through our skies much longer. Iridium, the company that put them up there, is taking them down. For more info, see their brilliantly titled “#Flarewell” webpage. Now that you know which is which, I hope deciding which to eliminate or enhance will become easier during your post-processing. Got a mystery? Post your photo (either in high resolution or cropped close to the object) in the comments section or on our Facebook page and I’ll help you identify it. I’m looking forward to sleuthing out some mysterious sky events with you. TIP: If you're reading this via email, try using a Web Browser for the best experience. What do you do when you want just that perfect night sky? Know your light sources and their color temperatures (in Kelvin). See below. Know the feeling you want to evoke in the viewer. Set the white balance on your camera manually. Process to taste later if the photo doesn't really match your expectations. With a little knowledge in-hand, you can shoot it right, in-camera. Keep in mind, I'm not going to offer some dogma about the "right" settings. It's not that simple. There are no rules. But a little knowledge goes a long way. So let's get on with it. 3200 K Studio lamps, photofloods, etc. * These temperatures are merely characteristic; there may be considerable variation. If you set your camera to 5500 K (Daylight), you'd see any light source mentioned in the chart above rendered in colors similar to what is shown in the first column. If you want a warm light to be warm, or a cool light to be cool, play it safe and shoot at the Daylight setting. In the above comparison (shot at Nahuel Huapi National Park in Barlichoe, Argentina), the very cool 3000 K white balance in full moonlight (left) makes it look distinctly like a night photograph, but a neutral 5500 K white balance (right) looks dull and lacks emotional qualities. This works well when you're away from city lights. There were some sodium vapor lights in the above image that added an orange glow, but when I shot at 3000 K, the glow was much less noticeable. If the above is too radical for your image, shoot at 3200 K or the Tungsten/Incandescent setting. This works well with moonlight, which is really just sunlight bouncing off a big, grey rock in space. So by choosing a cooler setting for "daylight at night," you'll be accessing that visual knowledge we all have of how the night should look to us. But did you know we can't see colors so well at night and we bias toward blue? Personally, I like the skies in the 2850 K shot better (left), but the foreground in the 3200 K better (right). Adding a color temperature gradient to slightly cool the sky would solve that in post-processing. When the moon is hiding around the other side of the Earth, and you can see the galactic center of the Milky Way, you want those colors to jump off the screen or print, right? To encourage those delicate colors to emerge like a flower opening up, set your white balance to 3900 K (right, versus 3200 K on the left). Once you start thinking in terms of what you want your photos to feel like and surveying the light sources in the sky—whether natural or otherwise—you'll start to master choosing a white balance that makes your vision of the night come to life. Honestly, just don't fret about it. Enjoy your quiet creative time. And always shoot RAW with a manual white balance. You can adjust files you shot in RAW no matter the color balance you set in the field. But isn't it fun to nail it when you're on the scene? Which Moon Phases are Best for Different Kinds of Night Photography? A bad moon may be on the rise. At least for an unprepared photographer. In addition to werewolves, waves and ancient planting customs, the phase of the moon has a strong influence on our night photography. Should we plan our shoots around the full moon? The first-quarter moon? Or is better to use the new moon? How do I plan for the third-quarter moon, and what does that even mean? If you find yourself asking these questions, you’re not alone. The lexicon of the lunar cycle can be tricky sometimes, but the knowledge is helpful for creating your best nocturnal images. Why? Because different moon phases illuminate the night to different degrees and in different ways, and therefore different phases lend themselves to some kinds of night photography better than others. To help make sense of the possibilities, here’s a brief primer on the phases of the moon and a guide to which types of photography are better suited for each. The four distinct moon phases are new, first quarter, full and third quarter. It takes roughly one month for the moon to complete the full cycle from new to full and back to new. This means there is roughly one week between each full phase. The new moon could also be thought of as “no moon.” Because the moon is not visible to us, this phase provides the darkest skies and the least amount of light. New-moon nights are great for capturing single-exposure star trails. Because there is no light in the sky (provided you are not near a city) you can leave your shutter open for hours without danger of overexposing. This elongated shutter time produces extremely long star trails. This is also a great time to capture those concentric rings around the North Star! The new moon is also a great opportunity to capture the Milky Way—the darker the sky, the more dim stars we see. As the cycle progresses, the moon becomes a small visible sliver. We call this a crescent moon. Because it’s on the way to becoming “larger,” it’s called a waxing crescent. The waxing crescent turns into the first quarter moon—the first full phase after the new moon. The name for this phase is a little confusing because at this point the moon is what most of us consider half full. Waxing-crescent and half-moon evenings are still good for star trails—even single-exposure star trails. However, the closer the moon is to first quarter, the more light will “spill” into the sky, making the sky brighter. The somewhat lighter sky tends to hide the dimmest stars. It also means you can’t leave your shutter open all night long. Exposures of 15 minutes or so are still achievable, though, providing enough time to create star trails of acceptable length. Waxing crescent moon. 20 minutes, f/2.8, ISO 100. The illumination on the mountains was provided by the city lights of nearby Sedona, Arizona. First quarter moons are great for practicing light painting. The longer exposures give you plenty of time to move around the scene illuminating your subject. But wait, can’t you light paint on new-moon nights? Sure! The only problem is that it’s completely dark and moving around the scene can be difficult. Most of the time you wouldn’t want to use your flashlight to light the way, as that illumination would become an unintended and unwelcome part of your scene. 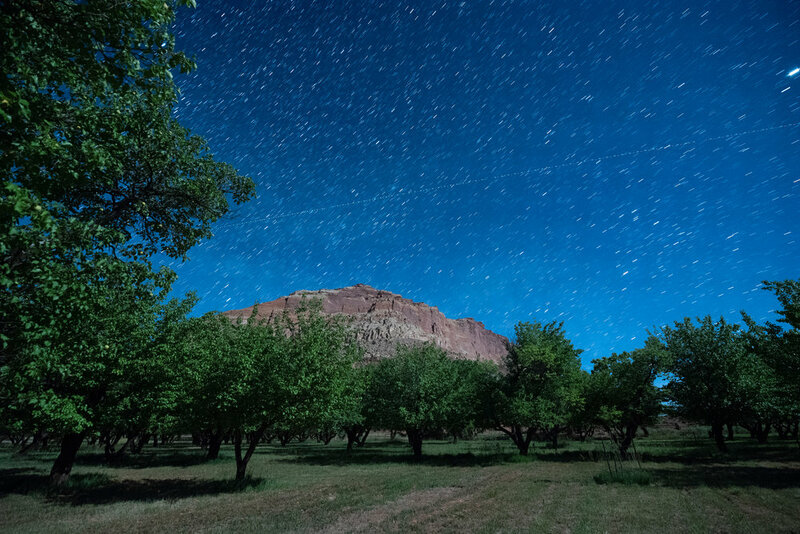 (See “Staying Invisible While Light Painting—The Art of Not Being Seen.”) Oftentimes first quarter moons provide just enough light to get around, without overpowering the sky and hiding dim stars. First quarter moon. 10 minutes, f/5.6, ISO 200. 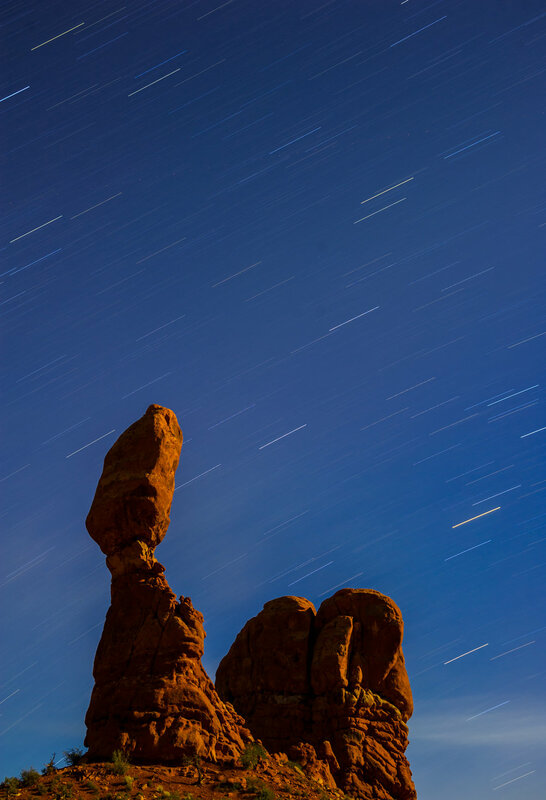 In Arches National Park, Balanced Rock in the foreground is gently illuminated by the half moon. On its journey from half to full, the moon becomes three-quarters illuminated, which is a called a gibbous moon. Because it is still getting larger, it’s called a waxing gibbous. Approximately two weeks after (and before) the new moon, we are treated to the full moon in all of its glory. The full moon is a great time for mixing light painting and the night sky. Full-moon nights can be so bright that it’s sometimes easy to forget it’s no longer daytime! It’s amazing how bright it is once our eyes become adjusted. This extra brightness makes it quite easy to move about the scene and can be crucial when trying to light paint from many different angles while navigating difficult terrain. It’s hard enough to concentrate on the timing and technique of light painting without adding in the concern of tripping or running into a tree because you can’t see. Full moon. 20 exposures at 3 minutes, f/5.6, ISO 100 stacked in Photoshop. I painted the foreground tree with a Coast HP7R flashlight covered with an orange gel. So what’s the downside of shooting under a full moon? The very same brightness that makes it easy to see and move around also forces us into shorter exposure times. Instead of 15 minutes or half-hour exposures, you’ll need to be shooting 2- to 5-minute exposures. Star trails will be significantly shorter in length when shooting so short. Is this is a problem? Absolutely not. For many photographers, though, longer trails are the desired outcome. Many folks feel that straight shots of just these short trails and a distant silhouette seem a bit boring. I agree, but I also find that the shorter trails are just fine as long as there is something else of interest in the scene. 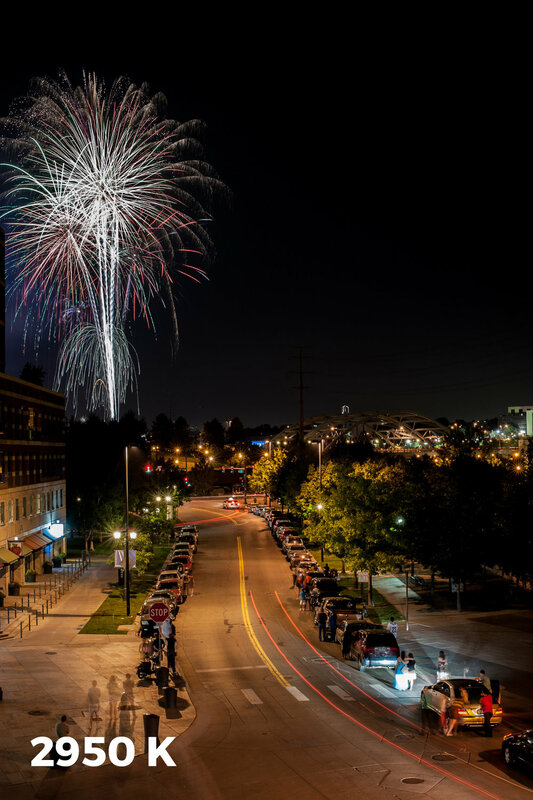 An interesting moonlit foreground, light-painted subjects, or even man-made illumination or car trails can do the trick. The extra brightness of the sky in this phase also means that we’ll capture fewer stars. The trick here is to use wider apertures. Of course using wider apertures will also shorten your overall exposure, meaning shorter trails. For that reason, "star stacking" is a common full-moon photography technique. Star stacking is the process of making many shorter exposures in the field and then stacking them together in post using Photoshop or another computer program. While no solution is perfect for all scenarios, star stacking is a great way to achieve longer star trails when the sky is too bright to leave your shutter open for 15 to 30 minutes. As the week advances, the full moon starts to lose illumination and once again becomes three-quarters illuminated. Just like the partial moon earlier in the month, we call this phase a gibbous. But because the moon is starting to disappear or diminish, it’s called a waning gibbous. The waning gibbous of course “shrinks” in size until it’s only half illuminated entering the next full phase, which is called the third quarter. From a photographic standpoint, the techniques and strategies for the third quarter moon are the same as for the first quarter. Moderately dark skies allow for long exposures, and a dimly lit landscape allows you to move about and light paint in relative safety. Third quarter moon. 8 minutes, f/5.6, ISO 400. As the moon loses illumination and continues through its final phase, it becomes what’s called a waning crescent. This last light of the night sky eventually disappears altogether and returns to its new moon (no moon) phase. The night sky is miraculous and a wonder to behold, and each phase of the moon offers unique opportunities to the prepared night photographer. All disciplines of photography benefit from an intimate familiarity with the subject matter. Night photography is no different. Think about your goals as you plan for your shots. Do you want long star trails and an interesting silhouette? Think about shooting under a new moon. Are you interested in light painting a subject but including the sky? Perhaps first or third quarter moon would be best. Is the moonlit landscape your ultimate goal? Consider planning your shoot around a full moon. Counter to what John Fogerty and Credence Clearwater Revival might have you believe, there is no such thing as a “bad” moon, at least for photography. You can shoot under any moon, as long as you remember which phases are best for different techniques. For a great explanation of the moon phases complete with diagrams, check out the website MoonConnection.com. For more on light painting, check out Tim’s ebook, The Magic of Light Painting. 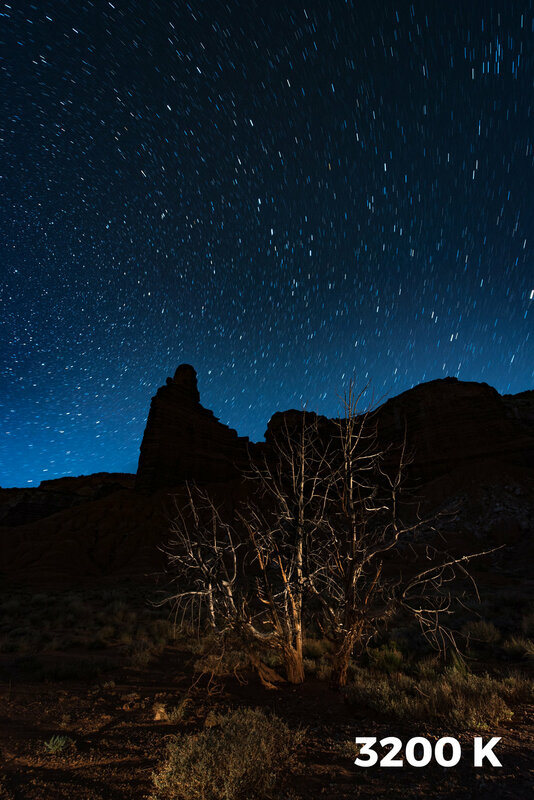 For more on shooting at night, check out Night Photography: From Snapshots to Great Shots that Tim co-authored with our colleague Gabriel Biderman. I recently led a few photo tours to Iceland to photograph the northern lights, and our groups each had the good fortune to experience several nights of clear skies and brilliant displays of aurora. It's an amazing experience, both to photograph and simply to see. One of the high seasons for aurora is nearly upon us, so I chose to write a primer on how to tackle this exciting genre of night photography. The aurora borealis, as the northern lights are also known, occurs when electrically charged particles from the sun are carried by solar wind toward Earth and collide with gases in the upper atmosphere. Those gas particles—most commonly oxygen (green aurora) and nitrogen (pink aurora)—are “excited” by the collisions, and release photons of light. Earth’s magnetic field deflects most of the solar particles, but that field is weakest at the poles. This is why the aurora is mainly seen near the polar regions. (Toward the South Pole, they're called the aurora australis, or southern lights.) In general, the chances of viewing the aurora in the Northern Hemisphere are best at latitudes above 55° N, and between the months of September and March. Historically, March and October are the best months for aurora viewing. There are a number of apps to help locate the aurora. The one we at NPAN have used the most is Aurora Forecast. Some of the newer apps seem to have more favorable reviews, and may be worth trying. Whichever app you choose, set the preferences to send you an alert for a Kp rating of 5 or higher, for middle latitudes if you live at or below 55° N latitude, and high latitudes above 55° N. Kp is the unit of measurement for geomagnetic conditions responsible for the aurora. Aurora and sodium-vapor, Reykjavik, Iceland. 20 seconds, f/4, ISO 2500. The frequency of clear skies is also a big a factor in seeing the aurora, but broken cloud cover can add a lot of visual interest in aurora photographs. The phenomenon can appear at any time when the sky is dark, but the best viewing times are typically from 10 p.m. to 2 a.m. Solar activity peaks and falls on an 11-year cycle. The winter of 2012-13 was the peak of the current cycle, which was theoretically the best chance to see auroral activity for the next decade. Luckily for us though, there has been plenty of auroral activity every winter since 2012. Iceland lies between 64° and 66° N, and is ideally suited for viewing and photographing the aurora. Despite being so far north, its position on the Gulf Stream keeps the winters relatively mild compared to other good aurora-viewing places such as Scandinavia and Alaska. During my two Iceland tours in 2015, we had good viewing conditions and good sightings for nine out of 17 nights, and really spectacular displays on three of those nights. Photographing the aurora is relatively straight-forward once you understand the basics. The remainder of this article is intended to provide the basic information required for aurora photography. It’s obvious that you’ll be photographing in cold weather conditions, and there are a few things you can do to protect yourself and your equipment from the cold. Warming hut. 20 seconds, f/5.6, ISO 3200. Dress in layers, making sure that your innermost layer is synthetic rather than cotton. Synthetic fibers wick moisture away from the body, keeping you warm and dry. Dress as if it will be colder than it really will be. Standing around for hours on end will make you feel much colder than if you were active or if you were outside for only a short while. Make sure your neck is covered, and find just the right hat. The best bet for your hands is flip-top mittens with chemical hand warmers and potentially thin, form-fitting glove liners. (We particularly like the Trigger Mitt by our friends at Vallerret.) If you’re going to Alaska, or somewhere frigid, extreme cold weather clothing can be expensive, but is essential. Photographing the aurora tests the limits of our gear, so this is a case where using the best equipment really makes a difference in the quality of your images. Cameras with full-frame sensors are ideal, as are fast, ultrawide-angle lenses. Cameras such as the or D750, Pentax K1, Sony A7R2 or A7S2, and Canon EOS 6D or EOS 5D Mark IV are particularly well-suited to this work. The next best option is an APS-C camera, such as the Nikon D500. But if you will be using an APS-C camera, I recommend sticking with newer models that perform better at high ISOs. Fast, wide to ultrawide angle lenses in the 14mm to 24mm range are the most useful for full-frame cameras, and those manufactured by Samyang under the brand names of Samyang, Bower and Rokinon offer a great value for about one-third the price of the comparable Canon and Nikon lenses, and they suffer less from coma at wide apertures. It’s recommended to test these lenses thoroughly after purchase, as quality control is notoriously inconsistent. The best zoom lenses for this type of photography are the Tamron 15-30mm f/2.8 and Nikon 14-24mm f/2.8. A lens hood is helpful not only for preventing flare, but also for protecting the front element from frost and condensation. Wellhead and aurora. 30 seconds, f/4, ISO 3200. A sturdy tripod is essential of course, and those with three leg sections are generally more stable than those with four or five. One exception to the three-section leg rule is the Gitzo Series One Traveler. This is one of our favorite travel tripods, as it packs small and is incredibly sturdy. A more economical alternative is the Manfrotto 190Go! Carbon Fiber Tripod Kit with Ball Head. Insulated leg sections are easier to handle, especially on aluminum tripods. Ball heads are better suited for this work than traditional pan-tilt heads because they can be adjusted quickly to track quickly changing aurora. Since exposures are generally 30 seconds or less, a remote release or intervalometer is helpful, though not required. In fact, the cables can freeze and break in extremely cold weather, so if the temperature is below zero F, you’re better off without one. If you are working without a remote release of some sort, be sure to use the 2-second delay on the self-timer to avoid camera movement when depressing the shutter button. The only other equipment you’ll need is an extra camera battery or two. You’ll want to keep your extra batteries close to your body in an inner pocket, as they will not last as long in the cold. You can also consider connecting to an external power supply with the Tether Tools Case Relay Camera Power System. Remove any filters from your lenses, and be sure to use your lens hoods, which will help minimize frost or condensation buildup on the front element. A neoprene beer/soda cozy with the end cut off can be used to hold one or two chemical warmers to your lens, which also can prevent the lens from fogging over. Ambient light from towns and cities will obscure all but the brightest aurora displays, so make sure you are well away from urban areas. That said, the distant glow from streetlights or the last glow of a fading sunset on the horizon can add another element of color to your photographs. Sodium-vapor streetlights reflecting off of low clouds is another possibility to add contrasting color to aurora photos. Aurora and sodium-vapor clouds. 20 seconds, f/3.5, ISO 3200. Lunar phase and lunar elevation in the sky both have a profound impact on night photography in general, and on aurora photography in particular. Photographing without any moonlight will mean primarily silhouetted foregrounds, and longer exposures at higher ISOs. Photographing under a full moon will mean much brighter foregrounds (especially if there is snow on the ground), shorter exposures at lower ISOs and fainter aurora in your photographs. You can photograph the aurora at all phases of the lunar cycle, and the results will vary fairly dramatically; it’s just a matter of what kind of images you are looking for. My preference is to photograph between the first quarter and waxing gibbous phases, as there is sufficient moonlight to illuminate the landscape without overpowering the aurora. The first-quarter moon rises around noon, sets around midnight, and then rises about 45 minutes later each day until it is full. The full moon rises at about sunset and sets at about sunrise. If you include interesting foreground elements, you may want to add light painting, especially when there is little or no moonlight present. 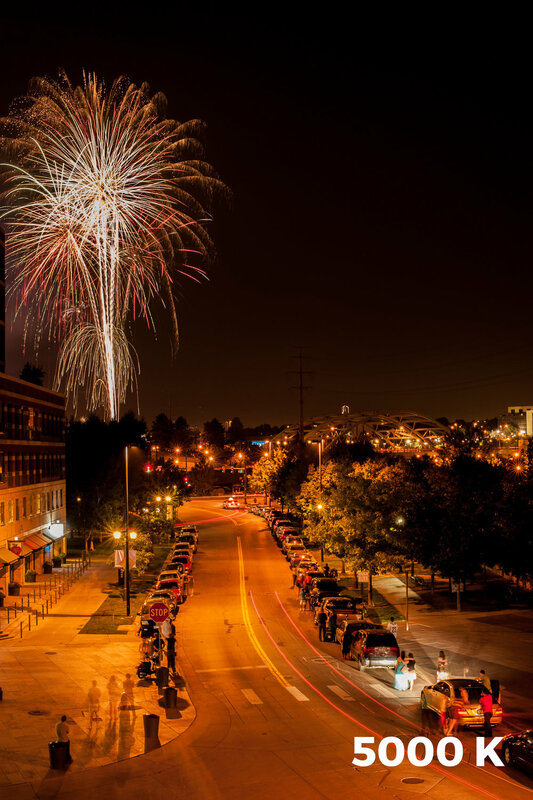 Aurora photography pushes the limits of even today’s best DSLR cameras. Because of the low light levels, and the need to keep exposures relatively short due to the moving nature of the aurora, you’ll be photographing at the highest usable ISO of your camera and the widest aperture that will yield sufficient sharpness and depth of field. Determining your highest usable ISO is simply a matter of testing your camera by making a series of low-light exposures at increasing ISOs, and then scrutinizing the shadow areas of each exposure, preferably by making final-size prints of the images. (See Matt Hill’s post, “Keep the Noise Down: How to Take an ISO Test with your Camera.”) For me, 1600 is the highest ISO I use for print-quality images and 6400 for web-quality with my 5D Mark II. Exposures for aurora photography range from approximately 30 seconds, f/2.8, ISO 6400 for faint to average aurora on a moonless night, to 4 seconds, f/4, ISO 800 for bright coronal aurora on a full-moon night. The intensity of the aurora can vary dramatically—sometimes it’s barely visible to the naked eye but shows up nicely in photographs, and sometimes it can be so bright as to illuminate the landscape. Determining exposure is accomplished by viewing a combination of the RGB histogram and the blinking highlight indicator. At a minimum, you should have a histogram that shows no shadow clipping—it can be a left-biased histogram, but the histogram should not be touching the left edge of the graph. Images with more exposure will have cleaner shadows with less noise. Ideally, you should not have to lighten your image in post-processing. Use the blinking highlight indicator to make sure that you are not overexposing the aurora or any highlights created by light painting. Use the LCD image preview primarily for confirming composition and focus. Here’s a rundown of the camera settings most important to photographing aurora, and my recommendations for how to set them. Set file quality to RAW. Use your camera’s highest usable ISO setting, hopefully between 1600 and 6400. Set white balance to between 3700 K and 4100 K when shooting under moonlight, or between 4000 K and 5500 K when there is no moon. Set your camera’s Long Exposure Noise Reduction (LENR) to Auto (if available) or on. Enable your camera’s RGB histogram to use as the primary exposure determinant in natural light. Enable the blinking highlight indicator to ensure that you do not clip the aurora. Set the LCD brightness to “auto” or reduce it manually to almost the lowest setting. Set exposure mode to Manual. For focusing, use magnified Live View with the assistance of a flashlight to illuminate your focal subject, or use conservative, well-executed hyperfocal distance. As with any type of photography, you’ll get better results with experience and practice. It’s very helpful to have a basic understanding of night photography, and to be completely familiar with your equipment before departing toward one of the poles. Simply working in the cold and darkness complicates photography exponentially, so do your homework, and be prepared. Don’t expect to get perfect results on your first attempt. Taking a moment to enjoy the aurora. Photographing the northern lights can be like photographing a close friend or family member’s wedding: You’re so focused on the task at hand that before you know it, the event is over and you’ve completely missed out on the experience! Make sure that you take some time to simply step back, look up, and enjoy the magnificence of this special phenomenon. Note: National Parks at Night's 2017 Westfjords, Iceland, Photo Tour is sold out, but there are at least a half a dozen U.S. national parks with opportunities to photograph aurora borealis, (and a few national parks in Iceland that we won't get to on this year's trip). To get early notifications of our 2018 workshops and tours, be sure that you are signed up for our mailing list. Last week was International Dark Sky Week. Did you get out and enjoy the stars? I did. In fact, I even got to enjoy a night in South Carolina’s Congaree National Park. Congaree is only half an hour outside the state capital of Columbia, but getting even just that far away from a city can make a big difference in how we see the night sky. In fact, it makes all the difference in the world. And getting even further away? That can make all the difference in the universe. I grew up in southern Connecticut, part of the New York City Metropolitan Area. We weren’t in the city, but kind of in night-sky limbo—far enough away from NYC to see a decent sky, but not far enough to see the best. So in my nightly experience, I knew the sky had stars, but not quite how many. I also did a lot of camping as a kid—with my dad, with my family, with Boy Scouts. We even did some camping in the national parks, especially in Great Smoky Mountains. I’m sure during those experiences I looked up at night, but the first time I vividly remember “seeing” how magnificent a starry sky truly can be, the first time I had that "supernova" moment, was in upstate New York on August 7, 1993. On a night stroll, I came to a clearing in the trees, gazed skyward and had this profound realization that I could see—actually see—the Milky Way. I once heard astrophysicist Neil deGrasse Tyson tell a similarly themed story about when he was a kid, growing up in the Bronx, very near the bright lights of Manhattan, thinking that there were only a handful of stars in the sky. When he learned how many were really there, that’s when his love of the universe began to dawn. I’ve been reading Tyler’s book Stars Above, Earth Below: A Guide to Astronomy in the National Parks. In the introduction he writes about how the parks are famed for preserving wild animals, beautiful landscapes, grand forests, amazing rock formations, and so on. But another preserved feature that many people don’t think about in those terms is the night sky. And it’s absolutely true. So much of the civilized world is so lit up that in most inhabited places we can’t see the sky the way that our ancestors did for 200,000 years. But in many national parks, we can. Those dark skies are there for us, preserved very close to their natural, dazzling, awe-inspiring state. As I mentioned before, Congaree has some wonderful night skies. So does Olympic, Everglades, Grand Teton, Yellowstone, Great Smoky Mountains, Joshua Tree. … The list goes on and on, perhaps right to 59 parks long. Moreover, Death Valley, Big Bend and Capitol Reef are designated as Gold Tier dark sky parks by the International Dark-Sky Association. 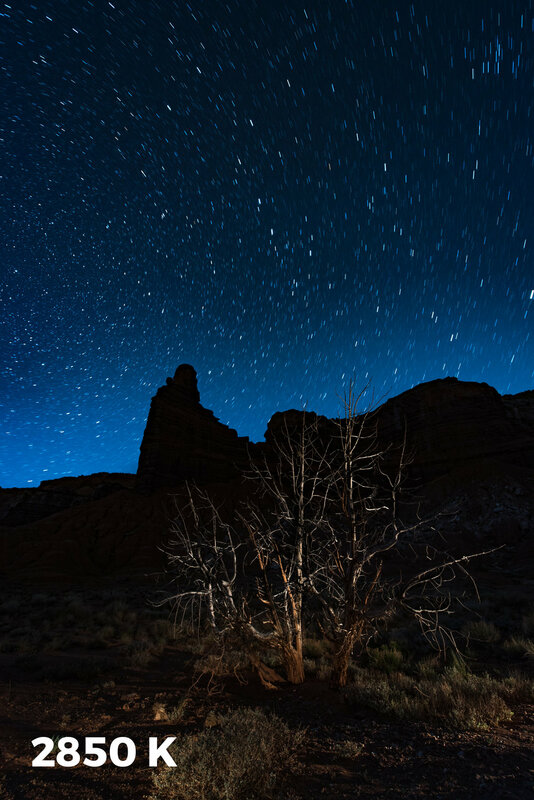 Additionally, Canyonlands and Black Canyon of the Gunnison are also certified as dark sky parks by the IDA. That’s right, five of the U.S. national parks are considered among the very best in the world at preserving pristine night skies. With all these great places to see and photograph under the gentle light of the universe, how does anyone sleep at night?